Complete your design with beautiful planters. Village Nurseries Landscape Centers carry an exceptional selection of popular shapes, sizes, and finishes from bright glazes to terracotta. Specializing in larger sizes. Available at Village Nurseries Orange, Huntington Beach, and Miramar (San Diego). 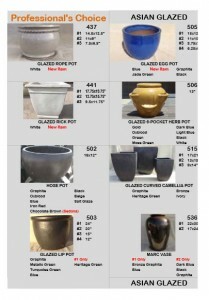 Click here to view our complete catalog.